Hydrogen and fuel cells are starting to be deployed commercially for mainstream applications. For example, fuel cell cars are now being mass-produced and are likely to be available at competitive prices, in ever greater numbers, in the coming years. They offer a similar driving and refuelling experience to existing vehicles while minimising air pollution. The Hub White Papers have shown that the versatile and zero-carbon nature of hydrogen means that it can make a major contribution to a low-carbon future across several sectors, complementing low-carbon electricity. This work package focuses on socio-economic research to develop the models and analytical capability needed to generate new insights into how hydrogen technologies might be developed in the UK and globally e.g. Spatial Hydrogen Infrastructure Planning Model (SHIPMod), see Figure below. It examines the effective integration of hydrogen into the wider energy system and identifies the role the UK can play, through partnerships with industry, to contribute to and benefit from these developments. The numerous hydrogen production, distribution and consumption pathways present complex trade-offs between cost, emissions, scalability, and requirements for purity and pressure. In recent years, the policy and socioeconomics research area has focused on the effective integration of hydrogen into the wider energy system, including understanding the need for new policies and regulatory structures, and investments in new infrastructures. It has also examined how fuel cell vehicles might be deployed, based on historical analogues. by examining the robustness and economic implications of the conversion plan to different levels of take-up of hydrogen heating. While the Leeds H21 plan assumes that existing gas boilers will be replaced with hydrogen boilers, we are examining whether fuel cell micro-CHP could be a more cost-effective option in the long term for some homes. This research is being performed in conjunction with the UK Energy Research Centre (UKERC) urban energy vectors project. 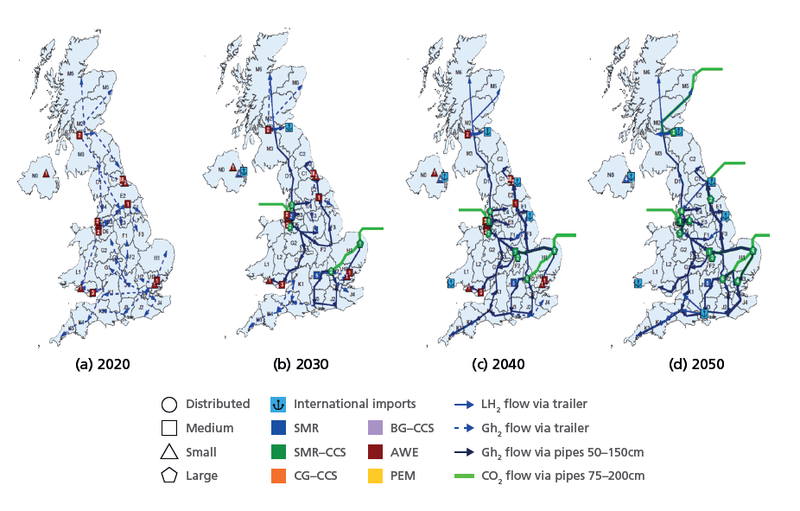 Optimised development of national hydrogen infrastructure for the “Full Contribution” hydrogen scenario of the Committee on Climate Change, in which hydrogen dominates building heating and road transport by 2050. Produced using the Spatial Hydrogen Infrastructure Planning Model (SHIPMod) by the HYVE project for the H2FC Hub White Paper on Energy Systems (Figure 6.3). This project is assessing the potential value of hydrogen to the UK. The researchers are estimating the potential demand for hydrogen in transport, industry, electricity and heat markets, as well as examining how hydrogen might be produced and supplied. At the end of the project, we will have a much clearer idea about how a transition to a hydrogen-fuelled economy could be brought about. The first stage of the project has involved model improvement and scenario development. The option to build a hydrogen pipeline network has been added to the Spatial Hydrogen Infrastructure Planning model (SHIPMod). The UK electricity network model is now working and a gas model is under development. A first test scenario has been developed to examine potential hydrogen deployment and is being used to test the model soft-linking that is central to this project. The website for the project can be found here, and a detailed Powerpoint presentation is available here.